(NORTH BAY, ONT.) – The Canadore Panthers plan to make some noise this weekend to help eliminate stigmas surrounding mental health, wellness and mental illness. 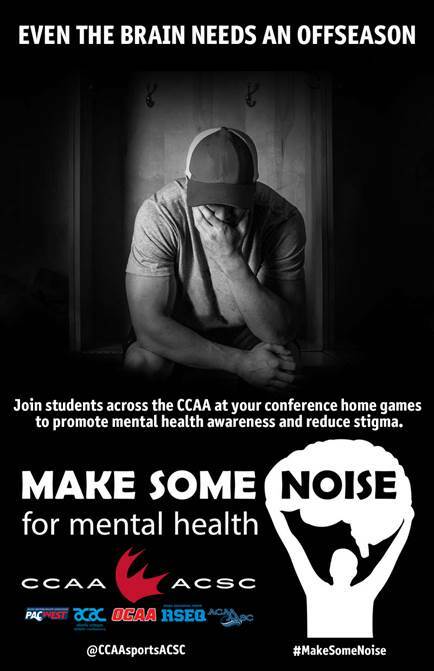 Canadore’s elite student athletes and their coaching staff are excited to be joining this nation-wide campaign driven by the Canadian Collegiate Athletics Association (CCAA), noting that mental health affects everyone. The Ontario Colleges Athletic Association’s (OCAA) athlete of the week for men’s volleyball, James Heslinga, will be taking the court on Friday night. Heslinga was recognized by the OCAA for his contribution to team-highs in points in back-to-back matches. He had 13 kills while adding a service ace in Canadore's five-set win at Fleming on January 20. The following day, Heslinga tallied a match-high 18 kills while adding a block in a four-set win at Seneca. He has hit double-figures in points in each of his last five contests. Time: Canadore Panthers vs. Loyalist Lancers WVB @ 6 p.m.
Canadore Panthers vs. Loyalist Lancers MVB @ 8 p.m. Location: Education Centre Gym, 100 College Drive, North Bay, Ont. During Friday’s games, spectators will have the chance to make noise, engage in meaningful dialogue, and learn about resources and support available to improve mental health as well as receive special edition giveaways. Panthers men’s varsity basketball will play on Saturday against the Loyalist Lancers at 4 p.m. and again on Sunday against the St. Lawrence Vikings at 1 p.m. Admission to varsity games is free, and complimentary hot dogs and popcorn are served to game enthusiasts. Spectators are encouraged to bring non-perishable food items to games to help stock the shelves of Canadore College’s Emergency Student Food Bank. Panthers athletics also includes men’s and women’s varsity indoor soccer, campus rec ice hockey, co-ed rec pickleball, co-ed rec ice hockey and co-ed volleyball. GET YOUR CLAWS OUT to support your Canadore College Panthers.